Prior to establishing a mid-level program, UNICEF USA supporters who gave between $1,000 and $9,999 fell into the Major Gift Officers’ portfolios. 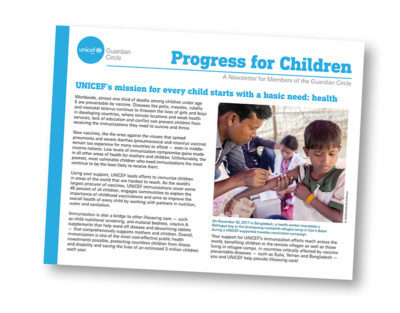 As low-end major gift prospects, UNICEF realized the organization was not communicating as often or as effectively, with these mid-level cohorts. Essentially, these donors were falling between the cracks – not giving at a level high enough to warrant serious investment from the major gift team but giving too much to be included in the traditional direct mail or digital program. UNICEF tasked MarkeTeam to develop a mid-level communication plan to more effectively steward these donors. The goal of the mid-level program was to provide these supporters with a highly curated experience and more personal touch. The first step was to determine who exactly should be included in the program. UNICEF wanted a more focused pool and MarkeTeam identified a mid-level cohort based on a proprietary predictive discriminant analysis (PDA) model. In addition, MarkeTeam layered on a multi-channel model with channel proclivities (high/low internet propensity) to identify online only prospects. UPGRADED THEIR GIVING YEAR OVER YEAR BY 20%. An internal concierge was hired to be the point person for the mid-level group. A higher touch direct mail program was developed, with mid-level donors receiving a limited mailing pattern than smaller donors. Most external communications, including direct mail, came from the internal concierge and included her direct phone line and email address. Personalized Thank You notes were sent out to each mid-level donor after each gift. A quarterly newsletter was developed and sent to all mid-level donors. Mid-level donors were invited to chapter and regional events with personal notes. Annual anniversary cards were sent by the concierge after a determined number of years of consecutive giving. The model is refreshed quarterly so hotline high-scoring prospects can move into the pool as their giving patterns dictate. Prospects with scores that drop below the threshold throughout the year are held in the program to allow for a full years’ worth of cultivation before being ‘downgraded’ to the standard direct response program. The more personal approach has paid dividends. The retention rate for the mid-level pool, while already high, increased substantially in the first year. However, the bigger increase was seen in average gift, as a significant portion of the mid-level pool upgraded their giving year over year by 20%.